Puccini's famous opera has been a hit with audiences since its first performances in the 1890s. Why See Dallas Opera - La Boheme? Since its premiere in 1896, La Boheme has grown into one of the most beloved operas in the world, with only Puccini's other masterwork Madama Butterfly rivalling it for sheer popularity. It's captivating romance and heart-wrenching tragedy are punctuated by the great composers soaring arias and glorious duets, masterfully fusing music and story-telling that plucks upon the audience's heartstrings. Pack tissues for Dallas Opera's latest production, featuring South African soprano Pumeza Matshikiza and French tenor Jean Francois Borras as impoverished lovers Mimi and Rodolfo. 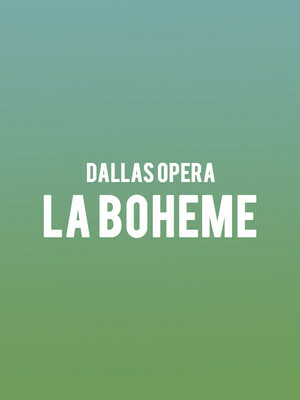 Seen Dallas Opera - La Boheme? Loved it? Hated it? Sound good to you? Share this page on social media and let your friends know about Dallas Opera - La Boheme at Winspear Opera House. Please note: The term Winspear Opera House and/or Dallas Opera - La Boheme as well as all associated graphics, logos, and/or other trademarks, tradenames or copyrights are the property of the Winspear Opera House and/or Dallas Opera - La Boheme and are used herein for factual descriptive purposes only. We are in no way associated with or authorized by the Winspear Opera House and/or Dallas Opera - La Boheme and neither that entity nor any of its affiliates have licensed or endorsed us to sell tickets, goods and or services in conjunction with their events.